Rolls-Royce said it has won an order to supply MTU engines for four new tugs for Aliança Navegação, a company owned by the Hamburg Süd shipping line. The shipping company uses 16-cylinder MTU Series 4000 propulsion systems throughout its Brazilian tugboat fleet consisting of seven harbor tugs, two of which are deployed in São Francisco in the north of Santa Catarina. 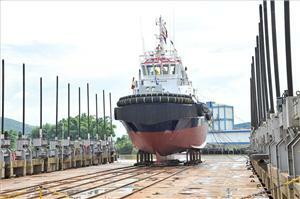 The remaining five tugboats are still to undergo commissioning. All tugs are being built by Detroit Brasil Ltda. The shipyard based in Itajai, Brazil has installed MTU engines in more than 30 vessel projects for customers such as Saam Smit Towing. "The MTU engines used for example by our subsidiary Starnav in tug boats are convincing in terms of maintenance and fuel consumption, and some of these vessels have been in service for over seven years. We have fourteen 16V 4000M63 units in our fleet and some of them have clocked up almost 30,000 operating hours," said Sergio Camiruaga, Executive Vice President of Detroit Brasil-Starnav. Rolls-Royce has been supplying MTU-Series 4000 engines to Detroit Brazil since 2010 for use in harbor tugs as well as in platform supply vessels. "Based on our previous experience in towage applications, we had no reservations in recommending Hamburg Süd to use MTU engines for its worldwide towage operations. We have enjoyed good cooperation with MTU and will continue with them in offering good service to the customer," said Camiruaga. All engines MTU delivered to Detroit Brazil have already racked up over 1,000,000 hours of operation. "MTU takes around 30 percent of the Brazilian offshore market and also holds a leading position in Brazil's general commercial marine propulsion market overall. For us, Brazil is an important focal point, and it is a country where we plan to expand our market presence even further going forward. Our experience of vessels and engines gained during this large number of operating hours help us guarantee the customer a level of uptime which is absolutely as high as possible," said Knut Müller, Head of the Marine and Government Business unit at Rolls-Royce Power Systems.